On account of Monmouth's landing in 1685 Henry Duke of Beaufort gathered a unit of men from Devonshire, Somersetshire and Dorsetshire in Bristol1. After the rebellion ended the Duke of Beaufort then handed the regiment over to his son Charles, Marquis of Worcester who got appointed on 26 October 1685. In turn he was succeeded by William Viscount Montgomery on 8 May 1687. In the autumn of 1688 the regiment was in Hull, and it was here that this regiment arrested its Roman Catholic officers and declared for William III. Its Lieutenant Colonel Sir John Hanmer was appointed as colonel on 31 December 1688. Hanmer's regiment then sailed for Ireland and arrived in the Lough of Derry on 15 June 1689. Here it took part in the fighting to lift the siege of Londonderry. On 8 September it arrived in camp at Dundalk. In July 1690 it participated in the battle of the Boyne. In 1691 this regiment missed the main events of the campaign, but it was present at the siege and surrender of Limerick. After that it did not participate in any campaign up to the peace of Rijswijk. According to a 16 December 1698 list2 the regiment designated as 'Sir John Hanmor's survived the 1699 disbandings by being on the Irish establishment. 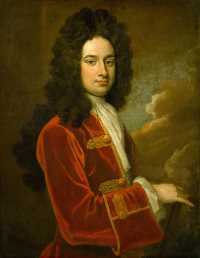 In the winter of 1701 Sir John Hanmer, baronet died. Hanmer was succeeded by James Stanhope, who was appointed on 12 February 1702. In April 1703 the regiment left Ireland and landed at Willemstad in May. Here it took part in the campaign and then left for Portsmouth. From there the regiment sailed to Portugal. Stanhope's regiment arrived in Portugal in March 1704. Here it was garrisoned in Portalegre together with two Portuguese battalions. This town was then besieged and the regiment taken prisoners of war. After getting exchanged the regiment arrived back in England in spring 1705. On 8 May 1705 John Hill was appointed as colonel and he started retraining the regiment. In 1706 the regiment then left for Portugal from there it arrived in Valencia early in 1707. On 25 April 1707 it participated in the battle of Almansa. The main part of the regiment was captured here, but a small part escaped. Under Lieutenant-Colonel Jasper Clayton it picked up reinforcements and had grown back to a force of 400 men by the end of the campaign. In 1708 a remarkable action was taken when the regiment was ordered to hand its serviceable men over to other units and to return to England to recruit. The regiment arrived in England in spring 1708 and after a lot of effort a renewed regiment landed in Oostende on 16 October 1708. In the early part of 1709 it remained in garrison and though it missed the battle of Malplaquet it did participate in the siege of Mons. In 1710 it was in the covering army for the siege of Douay. In 1711 the regiment joined the expedition to Quebec which its colonel was to command. In the disaster on the Saint Lawrence River the regiment did not suffer any losses. On 8 July 1712 it occupied Dunkirk as security for the peace agreed with France. In July 1715 Brigadier-General Hill was succeeded by Edward Montague. 1) For Stanhope's regiment see (unless otherwise stated): Historical Records of the British Army London 1837, The Eleventh or, North Devon regiment of foot. 2) House of Commons Journal Vol. 12 16 December 1698 has Sir John Hanmor's on the establishment of Ireland.